Long Island City’s largest Halloween event is coming back for yet another year this weekend in a day that includes pre and post parties, a march and more. 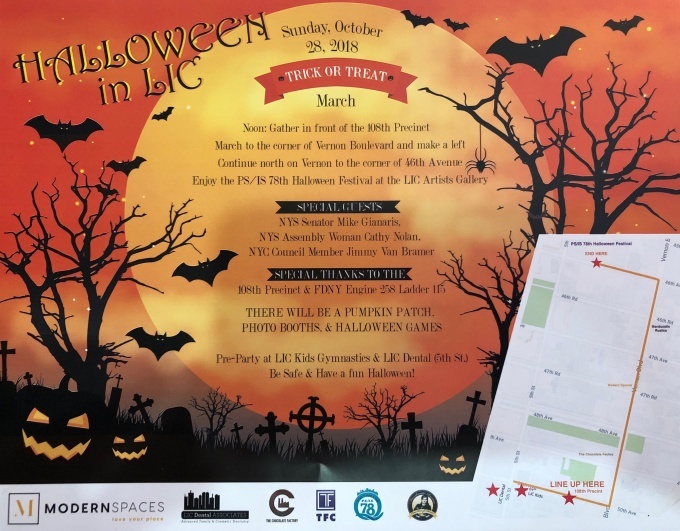 “Halloween in LIC” will take place on Oct. 28, with three major events scheduled throughout the day in Hunters Point–a march, a fall festival, and a small party before the march kicks off. The march will begin at around noon at its usual gathering spot in front of the 108th Precinct at 5-47 50th Ave. before heading up on Vernon Boulevard until 46th Avenue. The six blocks on the boulevard will fill with more than a thousand costume-clad marchers, as the event typically sees, with businesses along the corridor offering candy, treats, and other goodies to parade-goers. A pumpkin patch, photo booths, and Halloween-themed games will also be set up at certain points along the boulevard. One major component of previous parades, however, will not be part of the march itself this year—the haunted house. 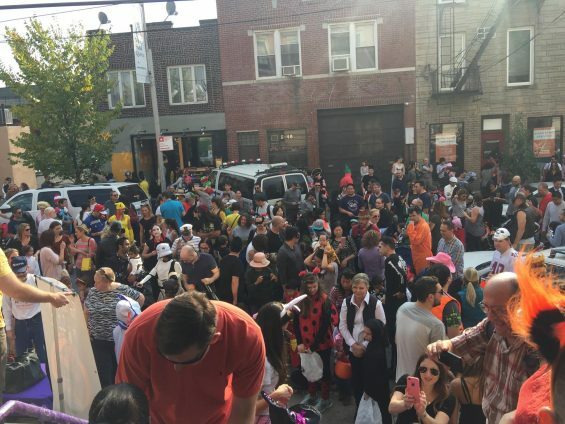 Gianna Cerbone-Teoli, founder of Halloween in LIC, said a haunted house as part of the march has been put off this year for safety concerns involving young children. 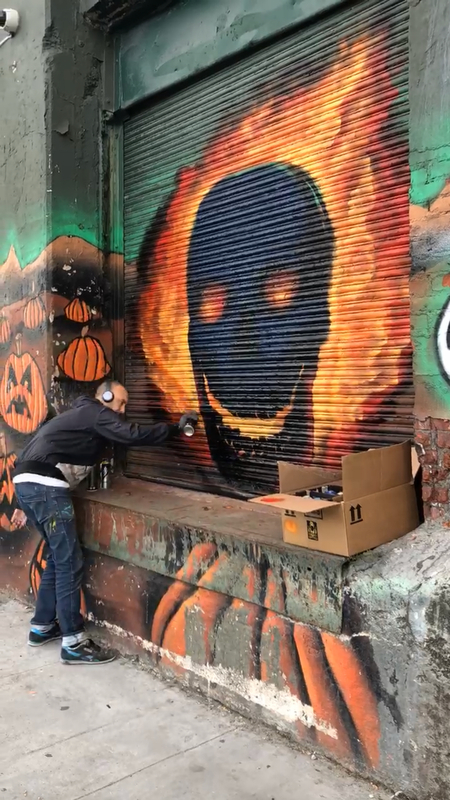 The walls outside the Paragon Paint building, however, will be covered in fresh, spooky murals to go with the march, Cerbone-Teoli said. The building had been used in the past as the haunted house location before recently closing down for construction. She anticipates, however, that a haunted house as part of the march will make a comeback in the future. The “monster mash” also did not make the lineup of events in the march, but two parties before and after will offer families and children the chance to dance, compete for prizes, and still roam through a haunted house. A pre-party, for instance, will be held at both LIC Kids Gymnastics and LIC Dental, located off 5th Street and 50th Avenue, just before the parade begins at midday. P.S./I.S. 78, meanwhile, will host its annual fall festival at LIC Flea & Food, located at 5-25 46th Ave., from 12:30 p.m. to 3:30 p.m. The parade’s course ends directly at the site for marchers to pour into. The festival includes arts and crafts, a “tattoo” table and fortune teller, a bouncy house, and a decorate-a-pumpkin section. A live DJ will play a monster mashup, while the Plaxall Building on site will be turned into a haunted house. All proceeds at the fall festival will help fun arts, music and education program at P.S./I.S. 78. All of the Halloween in LIC events are sponsored by a lineup of local establishments including restaurants, health clinics, real estate offices, and more. The march’s special guests include State Senator Michael Gianaris, Assembly Member Catherine Nolan, and Council Member Jimmy Van Bramer. Also happening in Long Island City for Halloween is a block party at John F. Murray playground. The party, on Halloween from 5 p.m. to 8 p.m. and put on by the Court Square Civic Association and the Swillinger Team at Level Group, includes prizes, candy giveaways, and a dog costume contest. I’ll be dressing up as the a supervillain luxury condo developer. Hopefully no one confuses me for Trump, as he’s a hero unlike every developer exactly like him. Boo! Hope all the adults and kids a fun and safe Halloween. See you there!